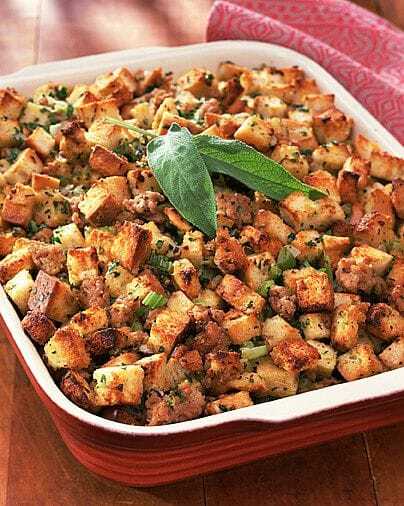 Though this is not one of Weight Watchers Thanksgiving Recipes, it’s a FABULOUS stuffing recipe for anyone who needs a delicious low calorie stuffing to put on their table this year! Plus, it’s my absolute favorite Thanksgiving recipe because I LOOOOOVE stuffing and I go crazy eating this stuff every year. So I had to find a way of making a lower calorie version of my favorite Thanksgiving food. Using the basic, traditional ingredients, this Thanksgiving stuffing is really too good to be true. To create this dish, I just took my mom’s traditional stuffing recipe, and altered it with lower calorie ingredients. Using the light bread and less butter really makes a huge difference without compromising taste. It has just a 2 point value for a 1/1/2 cup serving! Not bad!! so you can still enjoy all the fabulous flavors of Thanksgiving without sacrificing that diet plan you’ve been working so hard on all year. And it’s so yummy, you may just find yourself making this dish for non Thanksgiving Dinners too! Enjoy. I recalculated this recipe on 10/5/18. It is 3 Freestyle Points per serving. Sounds good, and I’m making this tonight with a “rotisserie” chicken, I’m making in my Instant Pot. Looking forward to it. I’ve never tried stuffing in a slow cooker…I worry its would become too soggy. But if you decide to try it out, come back and let us know how it goes!! Looks great. Was it the nutrition info OR Points Plus value. I’m assuming this is on the old points plan. Made this today! Fanstatic!!!! Everyone loved it! !